"The wealth and asset management industry in the Gulf Cooperation Council (GCC) region continues to develop rapidly, as the quality of the value proposition available to clients expands. With disruptive influences increasing in the region — from the weak oil prices to global technology trends and generational shifts — we expect to see a step change in the development of the industry as a whole over the coming years. to contribute to the growth of the region’s economy but its shape is changing as the market matures, with significant consolidation taking place among public and private sector banks — most recently between First Gulf Bank and National Bank of Abu Dhabi — and in the sovereign wealth fund space (SWF). In this year’s report, we look at how global trends are influencing the region. The recent focus on regulation and compliance is giving way to a new growth agenda, as the whole industry embraces technological change and looks for the new business norms this implies. The emergence of disruptive FinTech companies — start-ups offering technological alternatives within financial services — is starting to have an impact in the GCC region. More established companies are also starting to experiment with different applications of blockchain technologies, which simplify transactions through an open access database. They are also contemplating how the emergence of automated advice — known as robo-advisors — will impact the GCC region. These global drivers are intersecting with the regional realities of lower oil prices, prompting new strategies for preserving wealth during a time of considerable volatility in the GCC markets. In particular, assets under management (AUM) in traditional funds are falling in favor of alternative allocations, led mainly by private equity (PE) and real estate. The specific combination of these global and regional factors will shape the industry for years to come. I would very much like to thank the industry leaders who took the time to share their insights with us for this report. 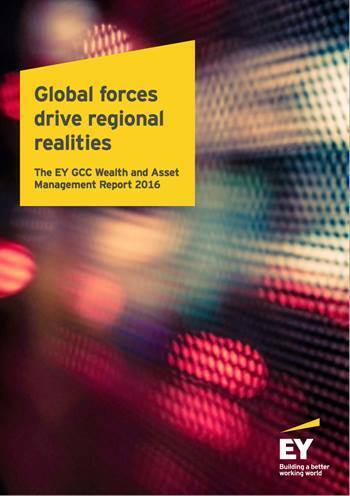 I am incredibly excited and delighted to release the second 2016 EY GCC Wealth and Asset Management Report."